Sponsored Post: This post is sponsored by Blue Apron, but the content and opinions expressed here are my own. I really do not like to cook and in fact I do not actually cook much at all these days. 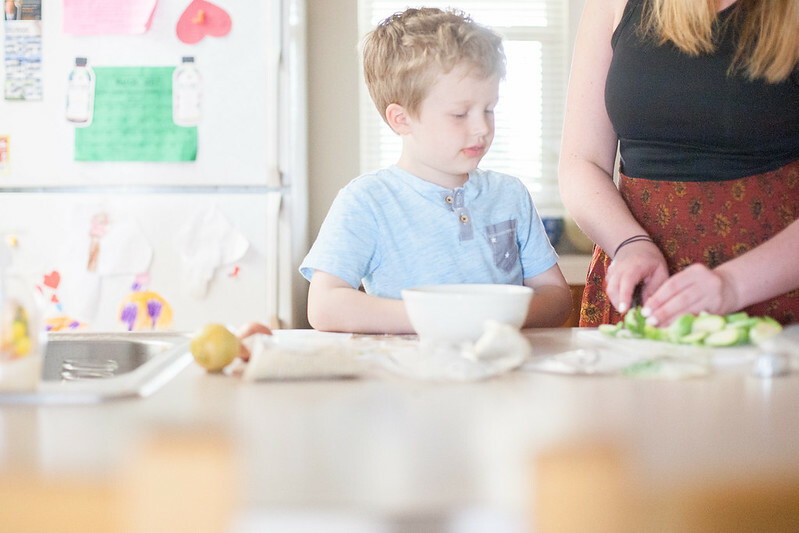 I used to do the majority of the cooking in our family but Aaron has taken on that role and I couldn't be happier about it. Sometimes on social media I'll see people posting about making an "easy" dinner and you guys I seriously am always thinking, "that is more involved than my elaborate dinners..." That's the extent that I cook. 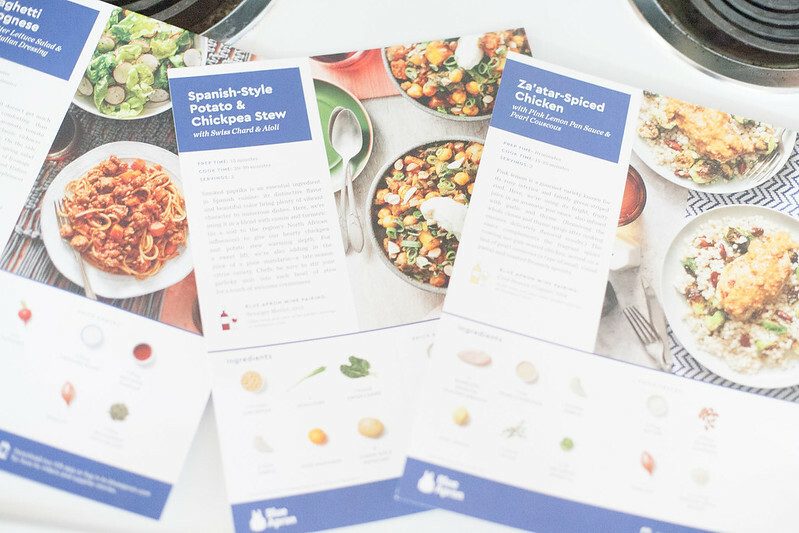 I've been seeing people order these Blue Apron boxes all over the place so I was really excited to get a chance to work with them and try them out for myself. 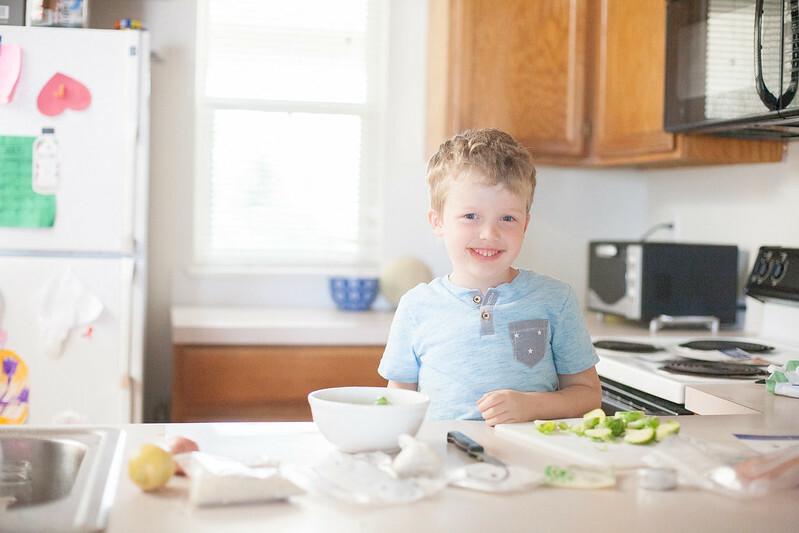 They describe themselves as a "fresh ingredient and recipe delivery service that helps chefs of all levels cook incredible meals at home." Sold. + All ingredients are GMO free. + Their meat has no added hormones and no sub-therapeutic antibiotics. 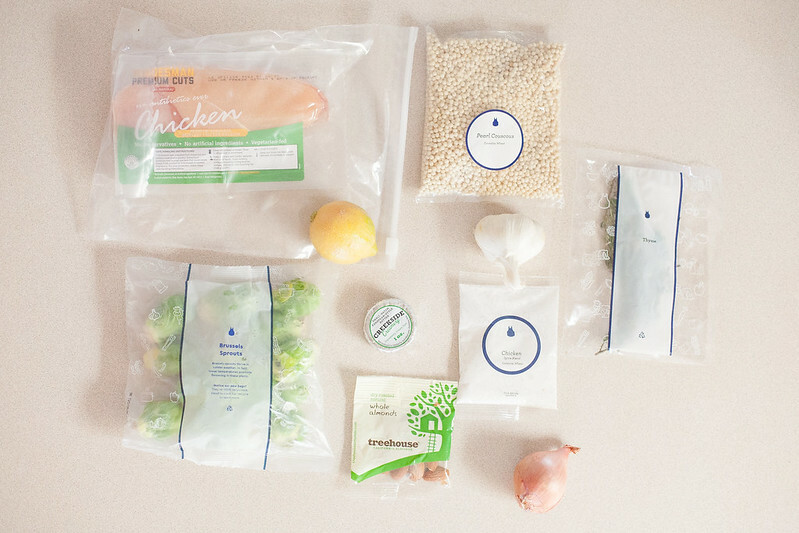 + Blue Apron offers a "Freshness Guarantee" on all ingredients and will replace anything that arrives looking subpar within the first 7 days. + They use sustainably sourced seafood. I was really impressed with our box. It included all of the ingredients necessary for 3 meals. Everything was neatly packaged and also kept cool and insulated. This box probably sat on my porch for a few hours and everything, including the meat, was still cold! Asher had a lot of fun digging into the box with me and seeing some foods he knew and many that he didn't recognize. 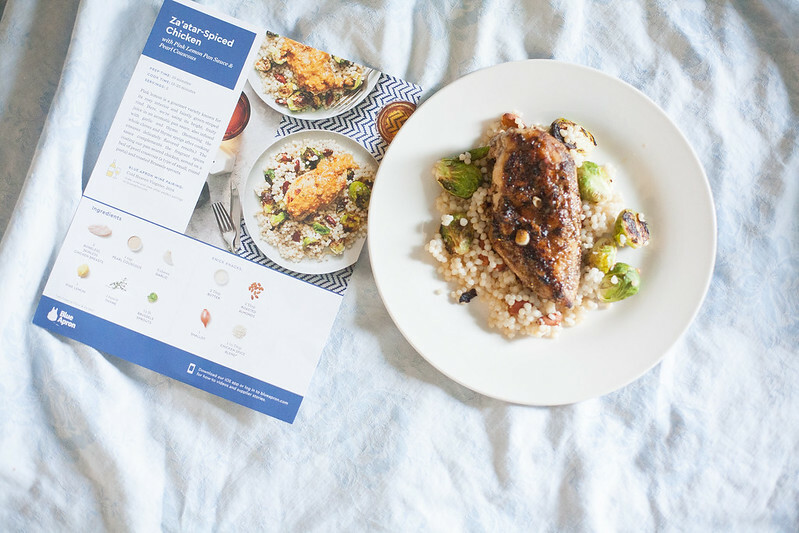 All of the recipes Blue Apron sent sound amazing but I decided on the "Za'atar-Spiced Chicken" first because I love anything with lemon and couscous. Here are all the lovely ingredients as they came packaged. Everything comes in the exact portions you need which honestly is so nice. 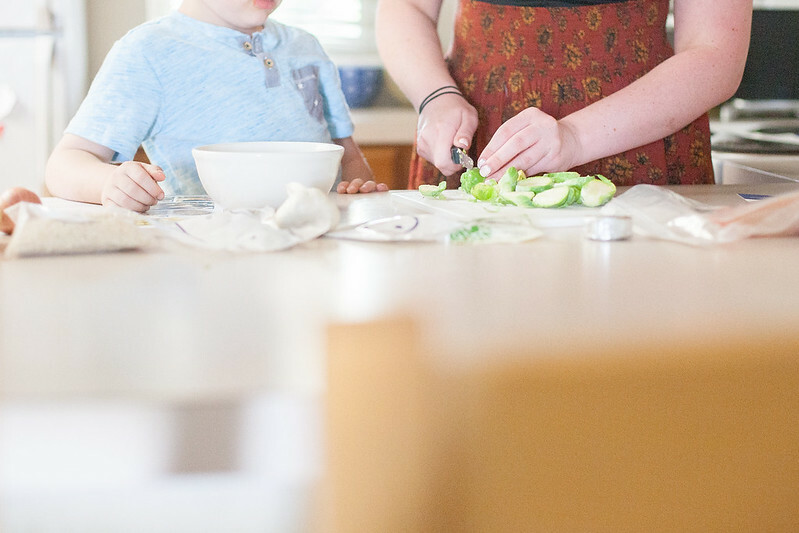 I love that Blue Apron takes away the grocery shopping + measuring aspect of cooking! This makes the process even easier for someone like me who is whiney about cooking. My cute little helper ready to go! The directions were extremely straightforward and helpful. I will say that this recipe was a little more involved than I anticipated but the meal was also "fancier" than I expected. I did have to google "how to mince a shallot," and I also set off the fire alarm twice, but the house didn't burn to the ground and I kind of shocked myself that this turned out so well in the end! This picture where I'm cooking the chicken is really something to write home about because even when I used to cook, I cooked mostly vegetarian. I squealed a little when I had to touch the raw chicken but it wasn't as bad as I feared and it was so nice that the seasoning for the meat was already premixed and ready to go! Voila! You guys, are you impressed? It turned out so picture perfect and it tasted amazing! The sauce that I made at the end was seriously so delish and made this meal just perfect. I've even been scavenging some leftovers from the fridge as I worked on this post. Do y'all like to cook? I feel like I never meet girls who don't love cooking so tell me below if you are like me! 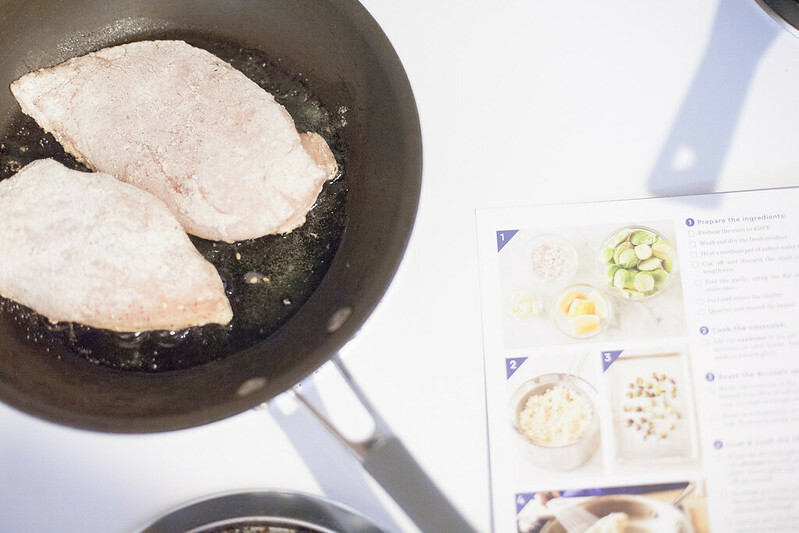 Have you been wanting to give Blue Apron a try? You can use my link to get $30 OFF your first purchase which is an awesome deal! I have been so curious about Blue Apron and their services! I just worry because we are really picky eaters! Great pictures, as always. I was so curious about them also and really excited to try them out finally! I am just like you, hate cooking. If I could afford it, it would be takeout errrrrr'yday. ;) Blue Apron is amazing though, makes it so simple & delicious! 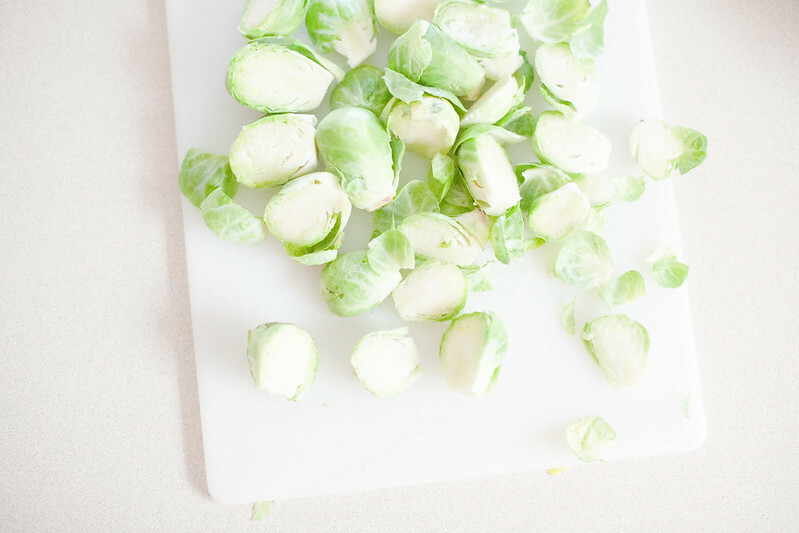 I love anything with Brussels sprouts. This looks so good!! 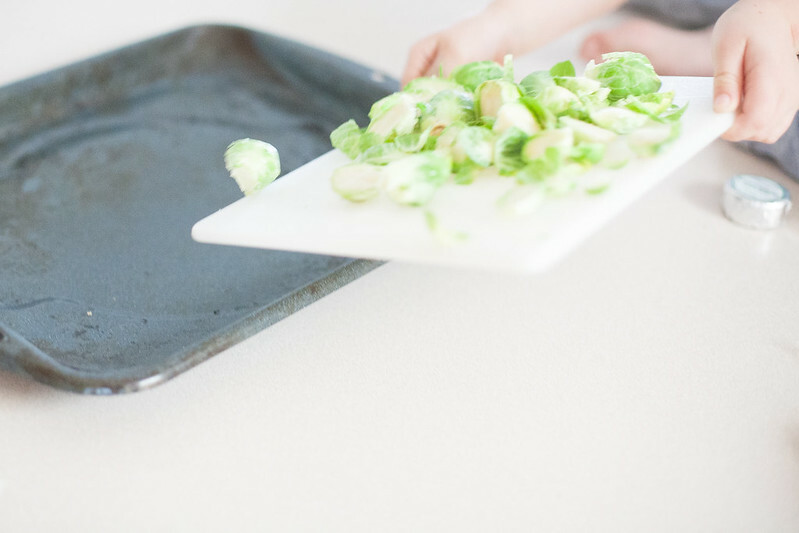 Brussels sprouts are one of my faves! I do love cooking! Especially trying out new recipes. We don't have Blue Apron in Canada, but we have a couple very similar meal delivery services that I've tried and I was equally impressed with the ingredients and how the recipe turned out! I don't like cooking either!! A service like this would be so helpful!! It's good to know that I'm not the only one who doesn't enjoy cooking! hahaha, loved the title of this! I've been dying to try them. This looks yummy! 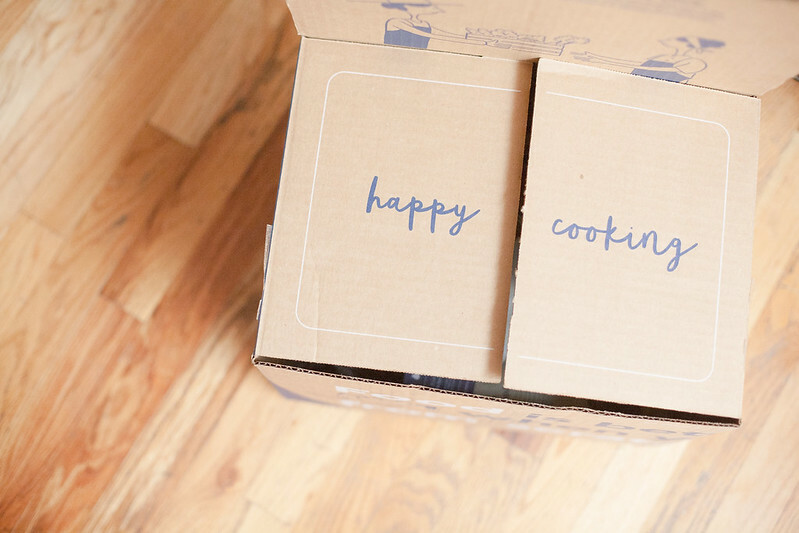 I used blue apron for a time and, despite feeling a little guilty at their excess packaging, I loved it! But it was way too much food for one person and I wound up eating the same thing for days (and also cleaning for days after preparing a meal).